I have something exciting for us today! Since I’m breaking in my new Ipad I’ve been trying out lots of new apps. 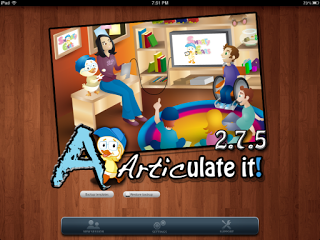 This week Smarty Ears gifted me an app for their articulation application “Articulate It” to test out and review. The good news is they also gave me 2 TO GIVE AWAY FOR YOU!!! I have several Smarty Ears apps but was new to Articulate It. Check it out in the Itunes store HERE. Best Features +Covers every phoneme +Covers phonological processes + Can use it in groups easily – either one turn or multiple attempts for each child. +Tracks data in detail + Recordings taken for sounds are saved into the data. This app has everything your articulation cards have and more! The pictures are clear and appropriate. It was easy for me to set up before the kids arrived. I just clicked to pick which kids to add to the group session, and then added the target sounds for each child. You can also take notes at any point during the session, which might come in handy when working in groups. I like knowing that it’s an app that I can use with my entire caseload (age 3-13) making it worth the money. I really appreciated the tutorial included within the app because I knew after watching it that I wasn’t missing any great features because I didn’t know how to work it! The only thing this app is lacking, is some bumped up entertainment value and the ability to work at the sentence level. The kids got bored after one or two sessions. The Ipad is certainly more entertaining than my traditional articulation cards, but the newness wore off pretty quickly. Future updates might include some time of reward/game for completing a certain amount of trials (a game with their sound incorporated would be even better!) Adding a feature that turns the target words to target sentences would be desirable as well! Although any savvy SLP is going to be able to quickly create those sentences during therapy. This is a great app that I would recommend for all SLP’s and even parents who wish to work on carryover of skills at home. The price is right to have every articulation/phonology card deck into one app on the ipad. In the end, having an app that tracks great data, and includes Articulation AND Phonology in a single app, outweighs any cons I could think of! So here comes the exciting part. To WIN A COPY OF THIS APP here is what you need to do. You need to… 1. Become a Facebook follower of Speech Room News AND 2. Become a blog follower (you can find both of those on the right hand side of this page.) Leave a comment on this page with your name and email! I will use Random.org to generate 2 winners one week from today! Goodluck! I just discovered your blog and love it! I’m officially cyberstalking you! 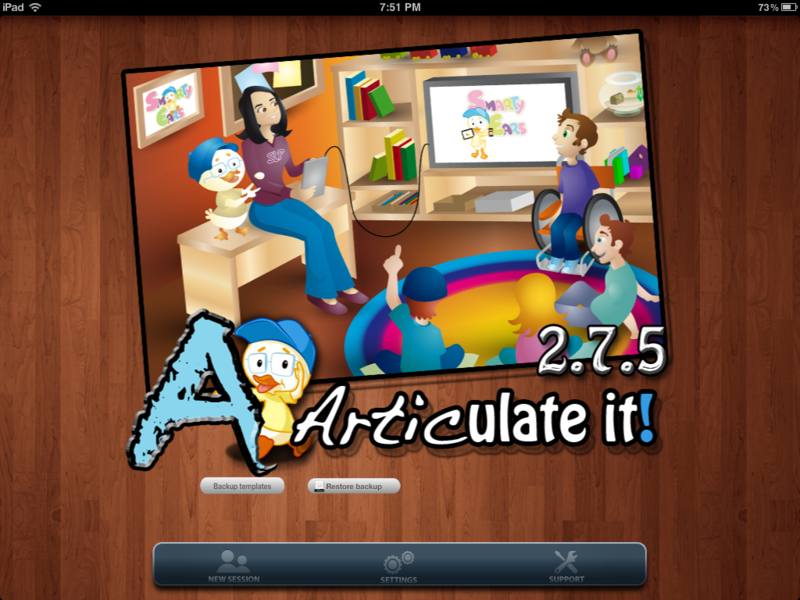 Have you tried Articulation! ? Wow we would love that app! It would be SUBLIME to have that to use to mix it up in tx! Danielle at daniellereed@me.com! I just found info about your blog on FB. I’m a pediatric SLP and would love this app! HI! Very excited to see your blog through a few of the facebook pages we are on together. 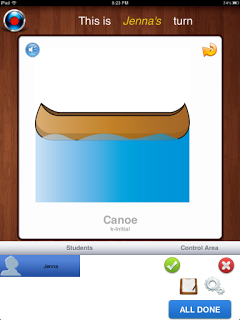 I would love a copy of this app for the students I work with. Although I am not an SLP, I place a HIGH priority on communication as a intervention specialist for students with multiple disabilities, grade K-2. Good Luck all!! I saw your post in the SLPeeps group on facebook! Thank you for the review! I, too, just began using an iPad in therapy. I would love to have this new app! Please follow my new blog, http://talkituptherapy.blogspot.com/. Thanks!!! Well YAY for giveaways! I love using my iPad in tx too! Yay! I love following your blog and your boards on Pinterest! You have a ton of ideas and I always find great things to apply while I am in graduate school! Thanks! Oh and I think your site is awesome!! Ahhh I would love to win this free app! Love your blog! I found your blog on Pinterest. I have gotten so many great therapy ideas. Thanks for sharing your creativity! This app would be great for so many of my friends! Thank you for the review! Santa gave me an Ipad for Christmas. I can’t wait to use it in therapy. I just got a new iPad and my first speech assistant job. I hope I win! WOO HOO!!! I love you blog! Glad I found this. Love new ideas. Just found your blog & love it. I would like to use this app with my speech students! Wow! Thanks Jenna. I am loving your blog and have been following it now for a month or so. You’re doing a great job. Thank you for sharing your creativity. Our lives are so busy that it’s great to share so we all aren’t reinventing the wheel every day. Thanks again for sharing your promo codes. I’d love to win one to use with children on my caseload in the schools. A friend pinned you on pinterest – you have such cute ideas! Thanks so much for sharing your creativity! I am now following your blog and liked your FB page! I left out my friend! Kendra!! Your angry bird war is a HUGE hit with my elementary kids! Thanks so much!! Also, I did my undergrad in speech and hearing at Ohio State and saw you did grad there…go bucks!!! Sounds like such a great app! Our county dept got all of the SLP’s an ipad and I’ve had a great time finding awesome tools that the kids love. Also, I made the Christmas tree and the preschool students loved it!! You have such great ideas! I have an ipad and am always looking for ways to make it work with my school kids! I love you blog. Thanks for sharing all the great ideas. I just found your blog in October, and have been a loyal follower since. You have fantastic ideas! I too, got an ipad for Christmas and am very excited to use it therapy. Love your blog….you have great ideas!!! Just found your blog and I’m in love! I would love to win this app! I am a bit of an app problem! I have had to institute a strict app budget. I have just about every speech app out there and many more education apps that I use for therapy. I have to say that up until the recent update Articulate It was my 3rd to 4th favorite articulation app. However today it became my FAVORITE! The new update is awesome! I used it today with my artic groups. I was able to set up each person with their phonemes, positions, and level (word/sentence). I was even able to change in the middle of therapy when I realized one of my students was not quite ready for sentence level! I absolutely love your blog and ideas. I have everyone of my friends/teachers asking for “french fry” boxes when they go on fast food runs. Thank you for the great ideas and connections! I like you on Facebook and follow your blog! Thank you so much for your freebies, they are quick and easy to print off, unlike some other blogs out there! I have been using “Capture the __” all day today with my students and LOVE it! Thanks so much. My Phineas and Ferb Cards are almost ready to laminate, along with the Angry Birds cards. I appreciate it so much! I would love to win a copy of Articulate It. I work in a primary and intermediate school so this would get lots of use. What a fabulous give-away!!! I have several language apps, but none for artic. This would be just the thing to put a strike of excitement into my therapy groups at school. What a great giveaway! I would love this app. I would love to use this app with my school groups!! I just found your blog…..great ideas. I also love using my iPad in therapy. We are just now going through the evaluation process and my 4 1/2 year old should start Speech therapy soon focusing on articulation. Thank you for all your hard work putting this blog together! Your blog looks super helpful…definitely some great crative ideas. So glad to have found your blog. Thank you for sharing your ideas to clueless parents like me. I love your blog! Thanks for sharing your creative ideas! Oh my goodness, this looks SO amazing! Love love tha app and would love t own it! Reg781@gmail.com. Thanks!!! Just found your blog & I am SO excited to try some of your activities in my therapy room! Thanks for sharing your knowledge! Your blog is awesome! I love to collect ideas from other therapists. P.S. I love your activities. My kids have loved the angry birds war game and the ipod categories game! Thank You, Thank You, Thank You for your app review and this opportunity! My email is different from my FB, too. My email, in the event my name is chosen, is romero_nk@aps.edu.